Tragic news out of the Bay Area... In Oakland, police are searching a gunman in the killing of a well-known neighborhood ice cream vendor who was fatally shot in his ice crime truck. The suspect is identified as 23-year-old Joevan Lopez, who is wanted in connection with the shooting death of 45-year-old Jasvir Singh, who was gunned down while he was driving his ice cream truck on Saturday afternoon in East Oakland. Police say the suspect approached the vehicle and fired five times before running away through backyards. 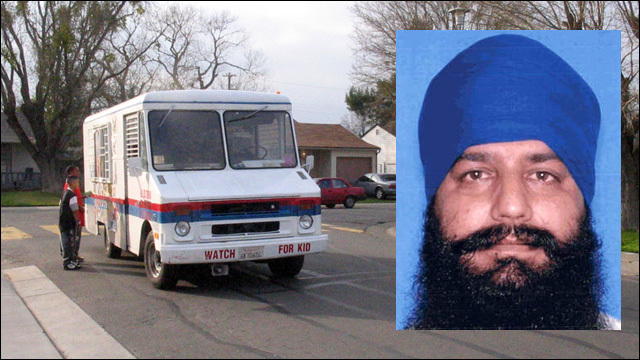 According to witnesses, Singh crashed the van into a parked car during the shooting. Singh reportedly died on the scene. According to police, a man with a gun approached the truck, shooting five times and fatally wounding Singh at about 4:30 p.m. while he drove on Peach Street between 92nd and 94th Avenues. The shooter ran away through backyards and the van crashed into a parked car during the killing. Singh's van is well-known in the area, decorated with stickers and signs advertising his wares. He died on the scene, as the Chronicle also confirms. Singh was 45 years old. Lopez is wanted on a no bail probable cause warrant. He is described as African American, about 5-feet 7-inches tall, weighing approximately 158 pounds, with brown eyes and dark dreadlocked hair. Police and Crime Stoppers of Oakland are offering up to $10,000 in reward money for information leading to the arrest of Singh's killer. Anyone with information is asked to call police at 510-238-3821 or Crime Stoppers at 510-777-8572.